Final Digital Project: Where is Dorsey Foultz? Dorsey Foultz is someone who has been on my mind for a while now. Since I found him hiding among the pages of Washington’s turn-of-the-century newspapers in 2013, his ability to capture the public’s imagination while evading literal capture has allowed me to explore race, policing, and print culture. Equally important to his story, but something I have not managed to examine to the extent it deserves, is the concept of mobility. Foultz’s ability to be everywhere and nowhere is a unique product of the historical moment; the rise of steam engines allowed trains and ships to move people and goods with unthinkable speed. According to the Smithsonian’s America on the Move Team, transatlantic journeys transformed from five-week to five-day endeavors. Travel had become over 85% faster within a period of 100 years! These innovations in transportation efficiency influenced how Americans understood space, time, and movement. 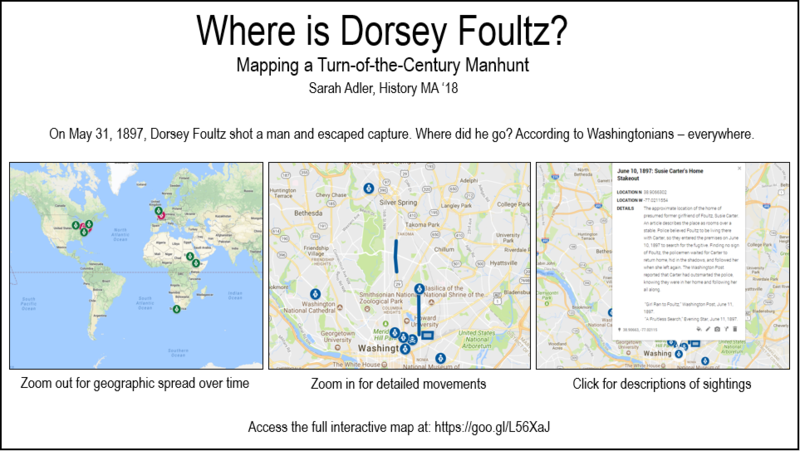 Through this map of Foultz sightings, I hoped to create an interactive visual that shows the extent to which the idea of mobility influenced police and the public during the manhunt. Compared to other map projects (like PhilaPlace, which has more features and information), my map seems fairly simplistic. However, it uses the same concept of allowing users to understand historical information visually and in comparison to present-day landmarks. While most historical map projects convey information about distinct locations, my map sets out to show movement over time and space, which I feel is not as conducive to the types of interpretive strategies used by sites like PhilaPlace. In this way, my project is more similar to something like the Monroe Work Today Map of White Supremacy Mob Violence, which is lighter on information but does a great job at showing trends. One hope I had for this project that wound up not being feasible was the inclusion of full primary sources with each point on the map. While Library of Congress materials have fewer copyright restrictions, a majority of my newspaper articles actually come from ProQuest Historical Newspapers, which I believe has more rights over its materials. I added interesting primary source snippets when possible, such as the supposed letters Foultz wrote from Africa published in the Evening Star and a map of the now-forgotten Jackson City (via LOC), but ultimately there are fewer images than I originally intended. In a future iteration, perhaps I could procure rights or find LOC-held contemporary drawings or photographs of more locations. The most interesting thing I found while completing this project was just how much sightings expanded geographically over time. I labelled the sightings that took place during the year of the murder (1897) with blue icons, those that took place between 1888 and 1905 with magenta, and 1906 and after with green. Even just a quick glance shows that Foultz sightings began close to DC (the farthest being about 100 miles away in Harpers Ferry) but expanded to over 600 miles away in Chicago by 1909. International sightings, which tended to be facetious but were not incomprehensible, reached over 7,000 miles away. Color-coding the sightings helps show that as time passed, police and the public imagined Foultz farther and farther away. The idea that he could still be in the DC area (immobile) seemed more ridiculous than him traveling across the country in this mobile era. Ultimately, creating this map helped me better understand my own materials. By reviewing articles for specific dates and places without needing to tie them into a traditional argument, I noticed different things. For example, when I originally found and wrote about the sighting at the “new Methodist University,” I assumed the newspaper was talking about Wesley Theological Seminary. Upon closer examination, I realized it was actually a reference to American University, which had been chartered relatively recently and was still very much under construction! I know the new information found through this process will be valuable as I continue my research in the upcoming years, and the map will hopefully help explain to future readers how much mobility mattered in at the turn-of-the-century in the United States. 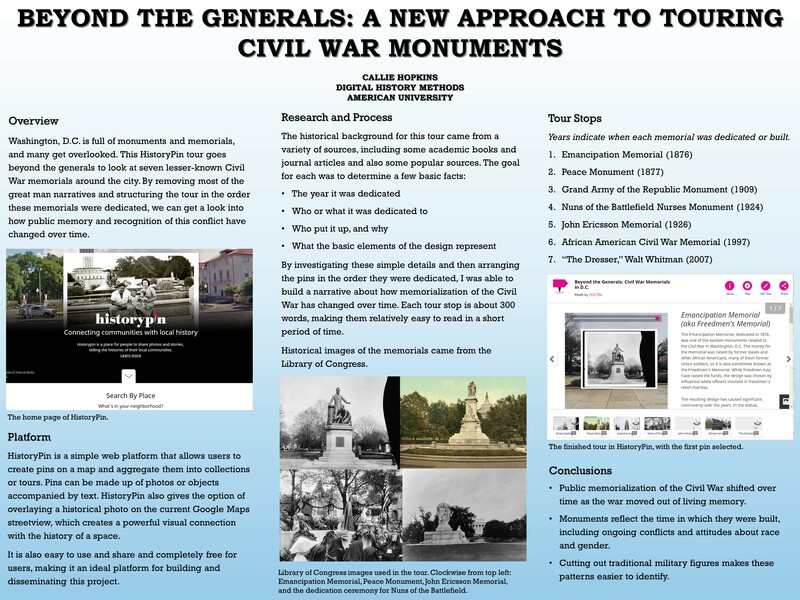 My final project is a HistoryPin tour entitled “Beyond the Generals: Civil War Memorials in D.C.” My goal was to dig into some of the lesser-known memorials and monuments around D.C. in order to draw out some more general trends in memorialization and how the way we publicly mark events changes over time. I chose to focus on Civil War memorials because there are so many, and to cut out all statues of generals as a way of narrowing down my selection. In order to trace larger trends in monumental architecture, I laid out the tour chronologically in the order in which the memorials were dedicated. From the rough draft to this final version, I have made a handful of changes. All the tour text has been revised and cut down, so each tour stop comes in around 300 words. I wanted to strike a balance between creating a substantive narrative and keeping things short enough for a person to read while walking around the different tour stops. I also added one more stop: the John Ericsson Memorial. It makes for a significant detour if someone wants to walk this tour route in order, but I have made note of that in the tour and labeled it as an optional side trip. One suggestion I received was to add another stop or two to round out the time frame, because the tour jumps from memorials dedicated in the 1920s up to one dedicated in 1997 with nothing in between. Unfortunately, it turns out that there were not a lot of Civil War monuments being built in those intervening seventy years, and I could not find anything to add. That said, I definitely think the absence of new memorials for such a long period is an equally important part of this story, and I have added to the tour text a bit to discuss that gap. HistoryPin did end up presenting some minor technical challenges. The mobile site is not as robust as I had hoped. A few of the historic images I uploaded kept disappearing – hopefully they’re all visible to you now, but if not, there are at least links in the text to get back to the image sources and see how they are supposed to look. And on the subject of links, the final issue was embedded links. HistoryPin automatically creates embedded link cards when you paste in a URL, and there does not seem to be any option to disable them. They make the citations look a bit strange, but all the information is understandable. Overall, given that it is straightforward, easy to use, and free, HistoryPin was still probably the best tool for this tour. My final poster is below, and I look forward to sharing more about this project with everyone in class! Note: This is part three of the readings. Click here for part one. Click here for part two. This article looks at different facets of the historical profession, how the do their work, and recommendations for change. A personal interest describes ;]p..the lack of training in actual archives for graduate students. They feel similarly unprepared to organize research or handle non-document sources. Is this a sink or swim experience being offered by academia? Have we spent sufficient time in this class looking at tools for research? Especially tools that might help organize the abundant research required by historical writing? Does this graduate program facilitate learning how to access information? Does this program facilitate collaboration and cooperation between students? With faculty? This post by the American Historical Association sets guidelines and recommends best practices for digital historians, and history departments looking to update to or work with digital scholarship or employing and evaluating digital scholars. The relationship depicted requires communication between the two, and encourages collaborating with technically minded institutions, like the friendly neighborhood/campus library. 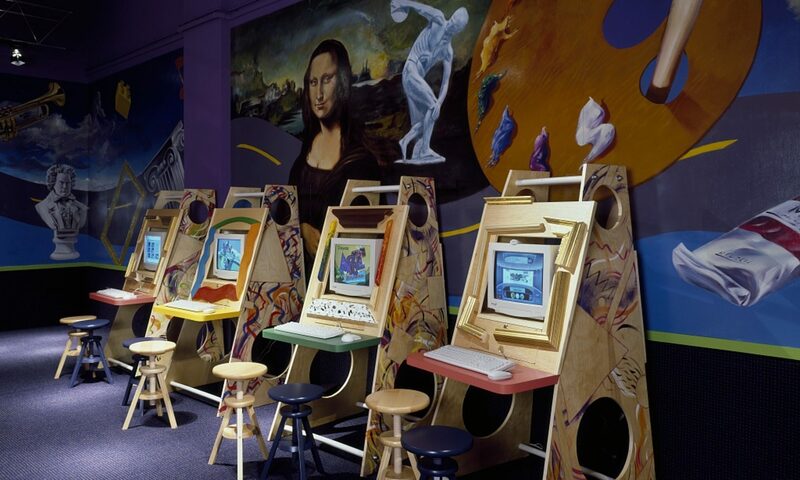 What responsibilities does the AHA place on digital historians? On universities? Is this enough to foster a productive relationship between traditional departments and digital historians? To what extent do the AHA guidelines respond to and work with this week’s other readings? Here Rebecca Conrad reviews Ian Tyrell’s Historians in Public. This work looks at the changes in the historical profession in the twentieth century, including the New History movement, the effect of the World Wars, and the genesis of public history. Tyrell’s work is largely a critique of these movements. He also makes the claim that public history is “an extension of academic history.” While a useful retrospective on developments in academia, Tyrell’s work has several problematic blindspots. Are historians specializing to find audiences? Or are they specializing to stay relevant and employable? Is all history public history? Is it the same as doing history in public? How does Tyrell’s work show his biases? Does academic historian maintain any fruitful connection to K-12? What relationship does history have to activism and social change? Congratulations y’all. That’s the last of the readings for this class. You did it, fam. The practica for our final week, PressForward and Scalar, are tools for organizing digital intellectual properties. Both platforms embrace a non-linear, born-digital approach to scholarship. While PressForward is a means to collect and curate existing scholarship, Scalar is a platform on which to publish one’s own work in an innovative way designed to incorporate all the best aspects of born-digital projects. Both platforms take advantage of the flexibility and the power of digital media to empower both the consumers and creators. PressForward is a free plugin of the WordPress blogging site. As such, its functionality compliments the blogging format. It is, essentially, a curatorial tool for storing and subscribing to articles and blog posts from other WordPress users. It’s analogous to Tumblr or Pinterest, but for scholarly works. In one’s profile, one can collect media from others’ blogs and categorize it in ways which make sense to the WordPress user. In addition to collecting individual articles, one can also subscribe to others’ profiles. This is useful in the case, for example, that another blogger has similar interests to yours and you want to see what they post in case it’s something you’re interested in curating. From a consumer standpoint, PressForward can be very useful for finding pre-collected information on various topics by experts in the field. This tool would, I imagine, be very useful during the early phases of a research project as one gets familiar with the historiography and wants to keep their materials in order. Likewise, it could be a very powerful tool for later reference, as the organizational tools allow each user to tag and categorize their materials in the way which is most intuitive for them. Two examples of the PressForward blogs are Digital Humanities Now and DH+LIB. The Digital Humanities Now mission is “refining processes of aggregation, discovery, curation, and review to open and extend conversations about the digital humanities research and practice.” Part of this mission is achieved by collecting works on this topic and sharing them through the PressForward platform. Digital Humanities Now collects “Editor’s Choice” articles and publishes them for their readers. If one enjoys an author’s work, they can follow links to the author’s other works, to the author’s reading lists, or to posts with similar tags. DH+LIB takes even further advantage of this platform “to provide a communal space where librarians, archivists, LIS graduate students, and information specialists of all stripes can contribute to a conversation about digital humanities and libraries.” Their highlighted articles—originating also from a variety of sources—are organized under several categories, such as “Data Praxis Series” and “dh+lib review.” These allow users to explore similar content by a variety of creators, pre-curated by those working at DH+LIB. This plugin, in short, takes advantage of the digital media capabilities of sharing, storing, and organizing information in a way which is best suited to each unique user. Scalar also capitalizes on the strongest aspects of digital media, this time with regards to the creation of digital scholarship. Scalar creates digital “books” either from existing print scholarship or as a born-digital work. These books are multi-media, non-linear, and highly collaborative. Scalar publications are serial in nature; these projects have separate pieces, which can include text media, videos, audio, photographs, and any other media plugins. Each of these projects can be consumed either in a sequential order or through tags. This offers the audience the choice of following the posts in sequential order, in alternate sequences, or following tags to find related information. This organization allows a wider audience to use Scalar books. Because the content can be tailored to different people’s interests and used as the audience wants, Scalar projects can appeal to either a popular or scholarly audience. The audience also has the option the write comments on any part of the Scalar project. These comments become a living part of the Scalar book and the ensuing conversation. This impetus on collaboration also extends to other Scalar authors. Every project in Scalar has the potential to be collaborative and works from a place of connecting people and ideas and from the power that lies in these connections. Other powerful connections offered by Scalar are the metadata about projects. This feature allows a content creator to see what works about their projects and on what they can continue to do or continue to improve. Scalar takes advantage of all the strongest aspects of digital media—connectivity, multi-media, collaborative, non-linear, available metadata—and has created a very powerful publishing tool for born-digital and adapted works alike. Historians are in the business of telling stories. These stories are told with the information attainable and the resources available to the audiences who want to listen. With tools like PressForward and Scalar, access to scholarship is increased dramatically. This means more dynamic projects with more authors and greater context. This also means that the projects can reach larger audiences, essentially anyone who would take an interest. These platforms take advantage of curatorial and organizational practices to allow audiences the freedoms to collect articles they’ve enjoyed, to subscribe to creators in whom they’re interested, and to explore scholarly projects on their own terms. They also empower creators to make content with the audience’s expectations and needs in mind. What truly impresses me is the potential both within the scholarly community and for the public audiences who has a more hobbyist interest in these subjects to aid in the dissemination and consumption of history projects. Where do you see the most potential in either (or both) of these products? In the hypothetical scenario that you ran a PressForward page, how do you imagine others would benefit from your work? How would you benefit? In what ways is a Scalar book more useful than a print book? Can you imagine any drawbacks? Note: Part 2 of the readings, looking at the first three articles. Click here for Part I. This rough draft of an introduction chapter has been posted online to facilitate discussion and feedback, as modeled in Planned Obsolescence. The Content of the article is like the book read for this week, so let’s instead focus on the comments. A few readers noted the long introductory narrative of Nate Silver as seeming not totally connected to the greater point. Others found issue with lack of disciplinary definition. Yet another had thoughts on grammar and sentence construction. Cohen responds to these commenters to explain himself, offer further insights, or even explain how the draft has already changed. Does this seem like a productive discussion? How does this mirror the examples given by Fitzpatrick in Planned Obsolescence? This introduction by Sue Baughman presents an article by Rikk Mulligan. Mulligan provides an overview of the history of the article and scholarly monograph, as well as problems and potential solutions to the form in the digital age. This article is presented in a super weird format I’ve never seen before, and after initial hesitation was actually pretty cool, though there’s little functionality beyond a traditional pdf. There is a social sharing options on the side, which is kind of cool if you have friends who are overtly concerned with the state of scholarly monograph. What did you think of the reader this article used? What value does the monograph have? What are some solutions offered by Mulligan? Are they feasible? As a graduate student, reading this article was very strange. It clinically breaks down the ways in which historians use specific types of sources, why, and their feelings on the digitization of those sources. Their conclusions are that historians will be remarkably slow to push for better coordination with the digital age (with the exception of Africanists and public historians). There’s a lot to digest for short article, especially concerning the enshrinement of the monograph (considering journals are more widely used and written), and the concern that undergraduates won’t seek out non-digital works. This was written in 2006. They’re talking about us. Does it exist if it isn’t digital? How has this been reflected in your own research? Does this twelve year old article reflect the current situation?